Made in Solingen, Germany, these unparalleled quality high-carbon steel forged knives are perfect for prepping meals in the kitchen. From slicing meats and breads, to cutting the most stubborn fruits and vegetables, as well as precision and ease of handling for more delicate skinned foods, Wüsthof knives are guaranteed sharp. Stringent quality control at Wüsthof factories ensure that your knife is razor sharp and of perfect quality right out of the box. The blades boast stain and corrosion resistance, and the full tang is triple riveted into the seamless, ergonomic, and incredibly durable polymer handle. 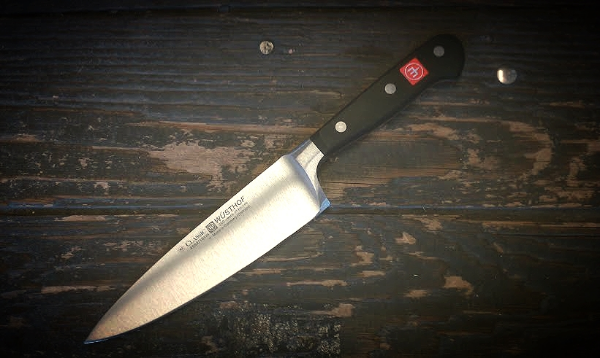 If you want a high quality knife that will last you for years and years to come, the Wüsthof knife collection you will find at Down To Earth will not disappoint. You will be pleased with the quality and usefulness of these knives whether you purchase as a gift for a loved one, or just to treat yourself and add to your collection of favorite kitchen tools. The difference in these knives is made apparent the first time you hold one in your hand. Use a sharpening steel to realign the blade after each use to keep the edge from dulling. Get your knives professionally sharpened about every year for optimal performance, or use the Wüsthof knife sharpener when your blades start to show signs of dulling.